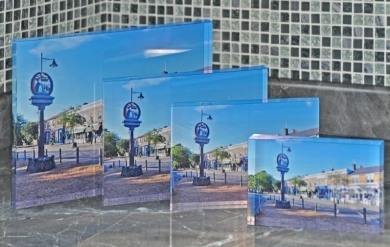 We can now adhere your photos to 20mm deep acrylic blocks with polished edges. This gives a very bright and contemporary finish. 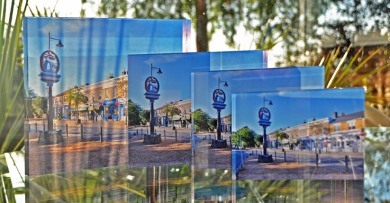 We have a range of standard sizes to suit most printed photographs, but we can also quote for bespoke sizes. For bespoke sizes, please call the workshop with you sizes and we will be happy to quote. We also sell read made sizes of acrylic wall frames with “stand- offs” (chrome fittings which hold the front and back of the frame together and hold the frame away from the wall) that you can assemble yourself. We can also adhere your larger photographs to acrylic wall panels with hidden “sub frames” behind in much the same way that we do with other substrates such as MDF or Dibond (see example here). Prices for standard sizes are below, again we can quote for bespoke sizes, please call the workshop with the details. These acrylic frames, which hold your images by sandwiching them between two layers of acrylic, are a stylish and an easy way to display photographs and graphics on paper. Easy to assemble with no special tools or skill. 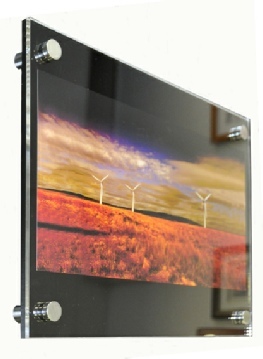 Our self assemble packs include all the components for you to assemble and hang. The coloured back panels can be Black, White, Frosted, Pearl or Graphite with a 5mm clear face panel. 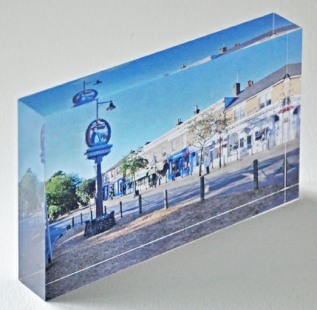 The image is usually smaller than the acrylic so the coloured back panel shows as a border. You can choose to take the image to the edge of the acrylic frame, then you will need to make holes in the paper for the Posts. 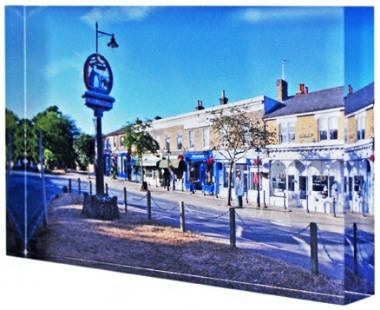 Serving Bromley, Chislehurst, Eltham, Orpington, Petts Wood and Sidcup, our acrylic frames are made using premium quality cast acrylic panels . They are precision laser cut to size, giving consistency of size and smooth semi- polished edges. The image is positioned on the back panel, where Post- Its can help, and it is held with a small piece of archival adhesive. The panels of acrylic are clamped with the Posts passing through the holes. A springy hanger fixes between the Posts on the back so it can be hung securely on standards picture hooks. Each pack contains;coloured acrylic back panel, clear 5mm acrylic face panel, 4 x satin silver anodised aluminium “stand off” posts with adhesive pads (to protect your walls), archival adhesive, springy hanger assembly, picture hooks and pins, anti- static cleaning cloth and assembly instructions.